It's Wednesday, and I am worried you simply haven't been minding your "P's" and "Q's" and since we don't want you get all barbarous on us, here's a tip from one of my favorite books, The Rituals of Dinner. If you thought dinner was just that meal you ate in the middle of the day (after 5 for you barbarians) or if for some unknown reason you never gave dinner a second thought, then Margaret Visser has a thing or two to tell you. Visser is that rare combination of historian and entertainer. Reading her is like picking up a novel and savoring the story. She adores writing about dinner. 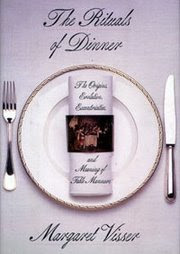 Before this volume, she wrote the equally entertaining, Much Depends on Dinner. The most spectacular exit ritual to send those lingering guests home is from the United Arab Emirates. When women gather for a dinner party and the hostess decided that it is time for her guest to leave, she perfumes them, so that her guests return home with a different scent, her scent. It should be reiterated here that this ritual is for a dinner party of women, lest some poor guy heads home smelling like Chanel No. 5 and gets clocked by a jealous wife. Also, bear in mind this is a rather elaborate ritual which bears no similarities to your last attempt to pass the make-up counter at Macy's and I am giving you the Cliff Notes version. This is how it works. A woman brings out her perfume box. Incenses are lit and passed around once, allowing the scent to waft under the head scarf and impregnate the hair. It is passed a second time and placed under her robes so the scent permeates her body. The idea is when you arrive home and smell differently, and people ask why and then you tell them what a lovely time you had at your friends house. This seems a bit time consuming if you want the girls to leave. The speedy solution is to grab your Calvin Klein's Eternity and pretend it's Macy's. They will leave in a flash. P. S. for P's and Q's. There is much debate over this expression and why it means to mind your manners. The most logical comes from printer's type as the two letters can look indistinguishable one needed to mind them, lest you end up with puick qigs. There are more colorful explanations, but we will stick with this one, probably because I am dyslexic. I not only mind my P's and Q's but also my b's and d's.